Cities are where the resources and products produced by the players are sold to. They are represented as circle and diamond shaped icons that occupy an entire location when looking at a planet on the viewscreen. The market value of a citys products will rise or fall depending on how much product is being sold to it. 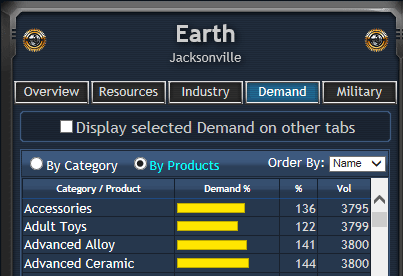 Every city has a "Demand" percentage for every product in the game. This represents how expensive or cheap that product is in that city. Selling enough products to a city lowers its demand and the demand slowly rises over time. The lower the demand for a product is, the greater percentage of population growth it contributes to the city. Each product also has a value for "Volume" which represents how much of that product the city currently needs for the price of that product to move by 1 point of demand. New cities are normally formed when a certain amount of industry is taking place at that location (3000 total output), usually from mining of the local resources. There is also a restriction on new cities forming on the same planet unless there is a total of 10 million population per existing city on that planet. New cities do not form on Earth, the cities there are static, but they can form anywhere else. A cities population growth is directly associated with how low the demand is for all the various products at that city. Each product demand contributes to the growth or fall of the city population individually. A value of 100 is a breakeven point where no growth or loss will occur. Lower values increase the growth rate proportionately, a 90% average demand will cause a 10% population growth per week (~1000 turns). An average demand of 200% will cause the population to cut in half every week. As the total population of a city grows the growth rate incurs a progressive penalty which prevents a city from expanding indefinitely. This penalty is approximately 1% per one million population (i.e. at 50 million the growth rate is halved) which makes a cities theoretical maximum population 100 million. Note that this penalty applies to positive growth values, negative values for high demand on a product is not penalized making these negatively affecting products progressively more significant as the city gets larger. Population is also broken out into 9 different groups representing the Upper, Middle, and Lower classes of population. 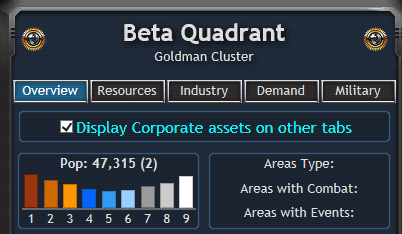 This is displayed on the Overview tab of the Viewscreen page and is a sum of all population on the viewscreen, zooming into a city will give you just that city population. The different classes of population are linked to the different products at different levels making them grow or fall more significantly depending on which product is being considered. For example, The upper class populations are more greatly affected by the demand levels for "Supercars" and "Personal Aircraft" products then the low class population, which probably isn't affected at all. These different population types is also what causes the Volume stat of a product to be different than another product in the same city as certain products cater more greatly so certain classes of population.